Are you aware that anyone (you!) can now broadcast live to YouTube through Google Hangouts? Think about the impact of that. You can now use the technology of Google Hangouts to record live action video, from several different locations if you wish, combine it all into a single broadcast, and have it stream to an audience of ANY size live on YouTube! This is a game-changer! Because it’s much more than it appears on the surface. 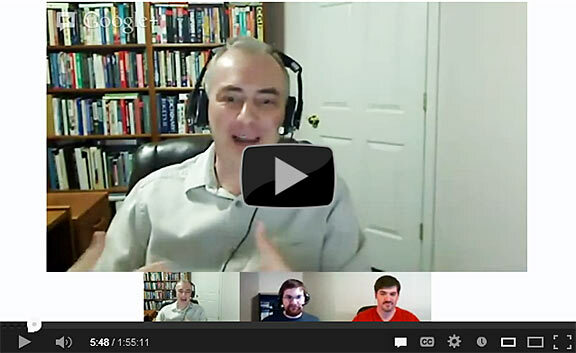 It ties in with Google+ not only to publicize your hangout, but to affect your search engine rankings too. And, as I said, it’s live streamed to YouTube, plus, within minutes of the conclusion of your broadcast, a recording is placed onto YouTube for all the world to see. All with your existing computer, webcam, and Internet hookup! Like I said, game changer! Here’s the replay of the Google Hangout Broadcast I recently did with a couple of my buddies, on how to use Google Hangout Broadcasts to build your business. It’s well worth watching the whole thing. In other words – watch all the way to the end! By the way, I’ve decided to extend the special bonus I offered until midnight Friday night, March 15th, so check it out now! What do you think? How can you see using this technology to build your business? Let me know by leaving a comment below. And don’t forget to share, like tweet and pin this!